So, I did manage to complete this coat before the weather turned warm . . . but just barely. This garment will be going back in the coat closet until Winter returns, but at least I managed to sew a piece of outerwear. 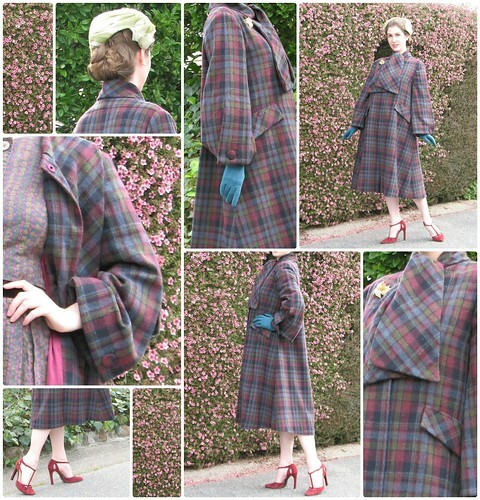 It was far too long since I made a proper coat! And with all the wool I have on hand, that is simply ridiculous. My expectation was that this design would be great for wearing with a crinolined silhouette. Alas, I allowed myself to be misled by the the line drawing back view. 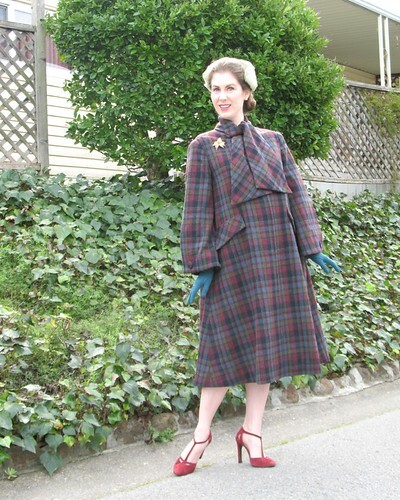 True, this is a fabric hog, but it is definitely not shaped like a vintage swing coat. To be fair to the pattern, from the front view, this is clearly not a swing coat. This is just another case of me seeing what I want to see. But other than a less full silhouette than I was expecting, I really love this coat. And while my coat closet could certainly use another solid colored option instead of this rather loud textile choice, this plaid desperately wanted to be made into a coat. Not to mention the fact that this yardage has been taking up space in a drawer for many, many years. I love the built-in scarf and the single buttoned sleeves. In fact, I might even make the short version of this design at some point if the right fabric comes along. Nive vintage coat! The built in scarf looks great! Perfection! Not only is it beautiful over a dress, I would wear it with jeans as well. It's just a great all around jacket. Just beautiful! I love plaid. What a lovely coat--the pattern would also work well for a glamourous evening coat (satin or velvet) or a light spring coat (linen?). I just love your work! Once again, and again, and again - your vision and talents are boundless! This coat fits perfectly in the vernacular of your wardrobe. Structure and swank (THAT lining!). Have you seen the movie, "Carol"? 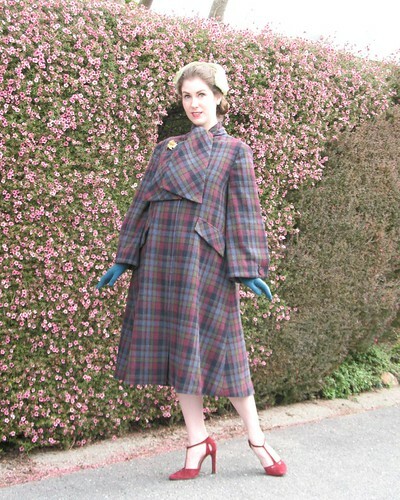 Great period dresses, suits, and outerwear. The clothes on the leads is derived from your style sensibility. Not one to wish for a cold snap, but a single wearing, with accompanying narration (you haven't dished lately on your doings, or public responses for that matter), would be most welcome. If no such luck, come next fall, I won't be the only one nattering you to model this creation. I love it. It's not quite a swing coat but it's still beautiful. Hoping more cold weather comes your way! People will be stopping you on the street to inquire where you bought such a beautiful coat. But there isn't anything in a department store that pretty or well made. Beautiful coat - well done! Love those shoes too.